One of the highlights of this year’s Pattaya Classical Guitar Festival will undoubtedly be the scheduled performance by Worrapat Yansupap, a young man who is fast earning a reputation as one of the nation’s brightest young musical talents. This 16-year old native of Saraburi province has enjoyed an almost meteoric rise to prominence in classical guitar circles in this part of the world, and despite his relatively tender years his list of achievements is already more than impressive. Having already cleaned up just about all the junior awards on offer during the past 2 years, Worrapat is now starting to make an impression in the senior ranks and this year saw him win the Mahasarakham Guitar Festival as well as taking 2nd and 3rd places respectively at the Hua-Hin and Philippines guitar festivals. Currently studying at the Mahidol University College of Music, Worrapat hopes that his love and talent for the guitar will enable him to forge a career in music and it’s a profession he has designs on reaching the very pinnacle of. The Pattaya Classical Guitar Festival will take place on Saturday, October 27th at the Siam Bayshore hotel in Pattaya. The event will kick-off with the junior competition starting at 9 a.m. and will culminate with a ‘Guitar Night Concert’ at 20:00. Admission to the Festival (inclusive of coffee breaks) is just Baht 500 for adults and Baht 400 for students (with valid I.D.). Tickets are on sale at the Siam Bayshore, Pattaya. 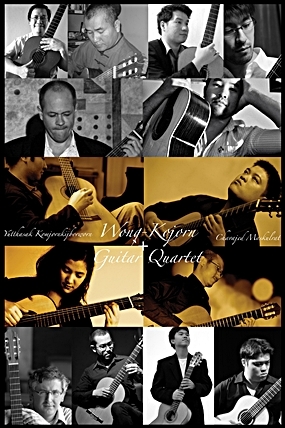 Call 038–428–678 for purchasing or e-mail [email protected] or to learn more about this event, visit www.thailandguitarsociety.com.